Despite the many uses of polyethylene materials or plastics, they remain a considerable threat to the environment. These materials stick around in the environment for decades because of their poor biodegradability thereby ending as a pile of garbage in landfills. Plastics can still degrade but scientists have been finding ways to effectively do so without compromising the environment. Until recently, some studies have tried using bacteria to decompose polyethylene materials but this method seems impractical because it requires first exposing the materials to light and heat. Led by Yang Jun, first author and associate professor at Beihang University in Beijing, China, the researchers found out that two strains of gut bacteria from waxworms can degrade polyethylene minus the need for pretreatment. Note that a “waxworm” is a broad name for the larvae of other related moths. 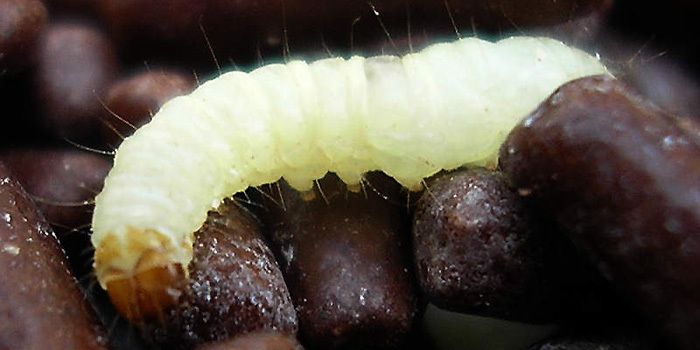 The particular waxworm investigated in the study was the larva of the Indian mealmoth. This larva is capable of chewing and eating polyethylene films. Upon inspection of its gut, the researchers have isolated two bacterial strains directly responsible for degrading polyethylene. These are Enterobacter asburiae YT1 and Bacillus sp YP1. The researchers incubated the two bacterial strains while on polyethylene films for 28 days. After the incubation period, they observed the surface of the polyethylene films using scanning electron microscopy and atomic force microscopy. They discovered presence of biofilms, a decrease in the hydrophobicity of the polyethylene films, and obvious physical damages including pits and cavities. Using X-ray photoelectron spectroscopy and micro-ATR/FTIR imaging microscope, the researchers further identified the formation of carbonyl groups. Suspension cultures of Enterobacter asburiae YT1 and Bacillus sp YP1 were able to degrade about 100 mg of polyethylene films over a 60-day incubation period. According to the researchers, the study could open new doors for handling or more appropriately, treating plastic wastes using plastic-eating waxworms. Further details of the study are in the article “Evidence of Polyethylene Biodegradation by Bacterial Strains from the Guts of Plastic-Eating Waxworms” that appeared in the journal Environmental Science and Technology. The researchers received funding from the National Natural Science Foundation of China, the National Basic Research Program of China, and the Shenzhen Key Laboratory Bioenergy.